Manhattan's Freeview adapter boasts multimedia playback, but how much of a '+' is it? 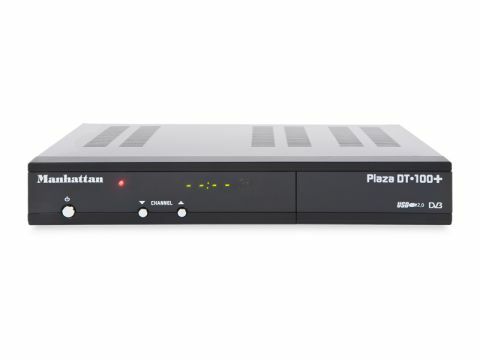 Two years after the launch of the Wotsat silver award-winning DT-100 Freeview adapter comes the Manhattan Plaza DT-100+. The compact case design remains pretty much unchanged from its predecessor save for now being predominantly black and having a flap on the right of the front panel that conceals a USB port. A green four-digit LED display shows the number of the channel to which you're tuned and the time when in standby and sits alongside channel-zapping and power buttons. On the rear are four UHF connectors that allow you to pass the TV signal on to other equipment (a patch cable is supplied). There's also a modulator for outputting Freeview channels via UHF. Two Scarts see RGB as well as composite supported on the TV Scart (the VCR Scart offers composite only) and there's a separate composite output. An S/PDIF connector and stereo phonos are provided for audio and there's a dedicated power switch. A pretty good line-up then, although those with large-screen HDTVs might have liked to see an upscaling option via HDMI as found on some Freeview PVRs (presumably this would have put up costs). The remote's curved edges fit snugly in the hand but, while reasonably well-positioned, its buttons are rather on the small side. You can skip between TV and radio channels at the press of a button. The mostly blue menu software isn't particularly flashy but its simplicity means it's easy to get to grips with. The receiver's automatic scan makes short and effective work of scanning for channels. A more in-depth manual option comes with signal and quality graphs and the ability to enter frequency, UHF network and more. Channels in the main list can be re-ordered and renamed using an onscreen keyboard and up to 10 favourites lists can be created and named. A clearly laid-out EPG supports seven-day DVB data displayed in grid form for five channels at a time with the current programme running in the top right of the screen and a synopsis on the right. You can skip back and forth by day and use it to directly schedule timer events. Up to eight events can be scheduled (also manually) with once, weekly and daily repeat options. Neat trick-play features are the ability to 'pause' (effectively freeze-frame) TV while the current programme continues in the background and generate a mosaic of stills for what's on nine channels at a time. The aforementioned USB port allows for playback of JPEG/BMP/GIF images, MPEG-2/VOB/dat/(certain) avi video and WMA, MP3 and Ogg Vorbis audio files as well as the application of software updates from flash drives. Folders are recognised and JPEG browsing comes with rotate zoom and slideshow options and the ability to play music at the same time. Audio files can be fast-forwarded but not playlisted. Our test sample played MPEG-2 TV recordings and also some of our XviD files encoded in an avi container. Playback is handled using coloured buttons on the remote and there are five speeds for rewind and fast-forward. Composite pictures are predictably soft, but those via RGB Scart are colourful and among the sharpest we've seen on a DTT adapter. Audio performance is solid from TV and radio sources as well as reasonably high bit-rate MP3s both via our test TV's (a Samsung LED) speakers and when connecting the digital and analogue connectors to a home cinema system.